Earlier today, Meg Rowley introduced this year’s positional power rankings. As a quick refresher, all 30 teams are ranked based on the projected WAR from our Depth Charts. Our staff then endeavors to provide you with some illuminating commentary to put those rankings in context. We begin this year’s series with first base. A year ago, first base looked to be a deep position, with a familiar set of stars occupying the top tier of the rankings, impressive debutantes such as Cody Bellinger and Matt Olson entering their first full major league seasons, and some long-toiling veterans such as Yonder Alonso, Justin Smoak, and Eric Hosmer appearing to have finally figured out how to mash at the level expected for the position. As a group, first basemen had combined for a 117 wRC+ in 2017 (their highest mark since 2011) and 70.2 WAR (their highest mark since 2009). Things didn’t go as planned for the position’s denizens in 2018. Paul Goldschmidt, Anthony Rizzo, and Joey Votto all got off to slow starts. Bellinger and Olson weren’t quite as impressive as they had been as rookies, with the former spending a lot of time in the outfield to boot. Hosmer, the recipient of the offseason’s biggest free agent contract, was a replacement level dud, and Alonso and Smoak both regressed. Joe Mauer faded after his best season since moving from catcher, Miguel Cabrera got hurt before he could rebound from a subpar 2017, and Chris Davis, who had been mediocre in 2017, turned in a season for the ages — but in the wrong way. And so on and so on. All told, first basemen’s production sank to a collective 108 wRC+ and 46.9 WAR in 2018, their lowest marks by either measure in our splits, which only go back to 2002 for such things. Collectively, their slugging percentage dropped from .487 to .438, and their on-base percentage from .347 to .333. Though it was only by a single run, first baseman did have their best year with the mitt since 2002, just ahead of 2017 — a trend that hints at the possibility that as a group, they’re not being selected merely for their offensive potential anymore. That’s a corollary to the reality that offensive levels at other positions, particularly in the infield, have risen as teams take advantage of the reduction in the number of balls in play — and perhaps better positioning data — to squeeze better hitters into spots that were traditionally harder to play. Then again, the offensive decline might just be cyclical, a reflection of the effects of aging upon a limited number of players who have made up the core at this position for years. 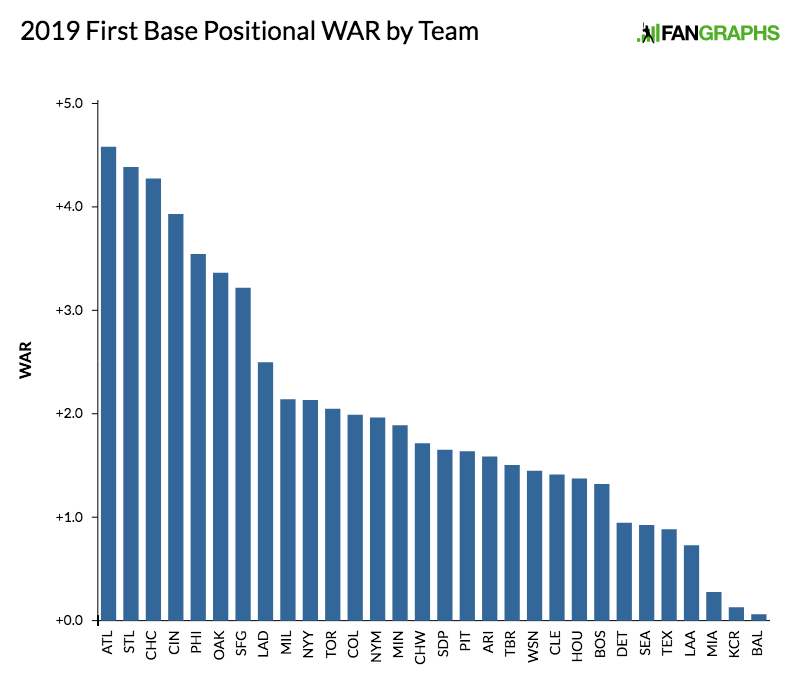 Exactly half of the players who have produced at least 1.5 WAR in a season as first basemen in the last three years were over 30, which means that odds are, they’re on the decline. None of us are getting any younger, even the Vottos and Goldschmidts. We hoped you liked reading 2019 Positional Power Rankings: First Base by Jay Jaffe! Inconsequential note for the author, the Mets AAA is in Syracuse now. So the part about Smith being in Vegas sounds a little more ominous than intended!